Banquet are up to their old tired tricks in my latest Deal of the Day, that features Orange Chicken. Even with "Natural" plastered all over the box, the chicken nuggets taste anything but. The main attraction is a big fail. 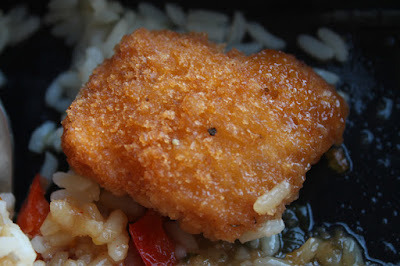 Nuggets are a good size, but it mainly breading and not much chopped pulpy white meat. Starting with the breaded coating you are sucked in. The coating is seasoned well and, surprisingly, stays somewhat crunchy. It was a good start. They might as well just used ground chicken, as the "chicken breast" is pulverized - no solid chicken that I could detect. The chicken meat could have been white or dark, as any meaty flavor is barely there. If you are going through the trouble of using 100% Natural Chicken Breast with Rib Meat, then don't grind it into pulp - at least leave it somewhat flaky? The pieces looked nothing like the back label photo. The Orange Sauce is more sweetness than orange flavor. The Orange Sauce around the chicken nuggets became a sticky puddle of syrup when heated through. It was okay, and mixed well into the rice. The best part of this meal is the rice and veggies. 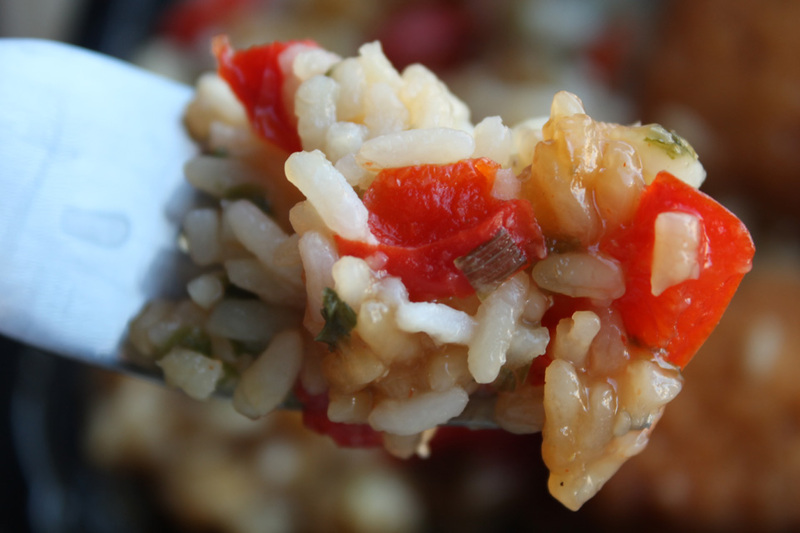 Usually frozen dinner rice comes out soggy, but this was cooked almost perfectly - a firm texture, but still cooked through. 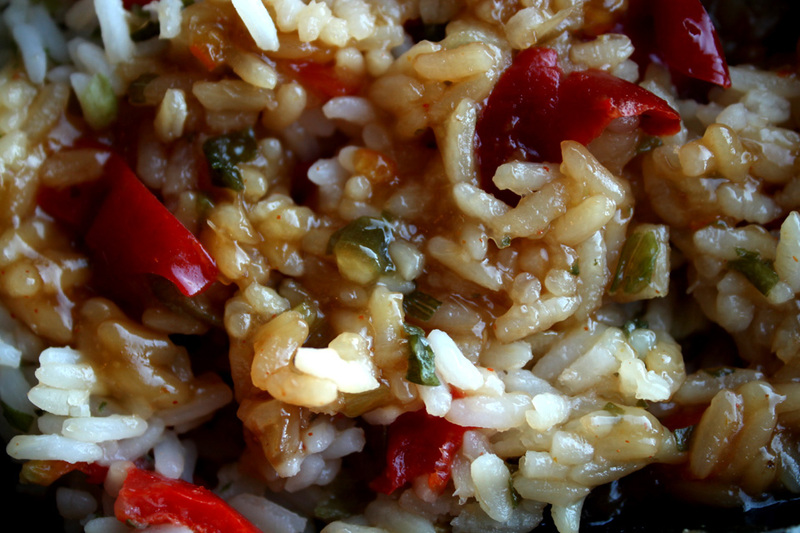 The red bell pepper pieces were very thin, with a tiny amount of veggie flavor. 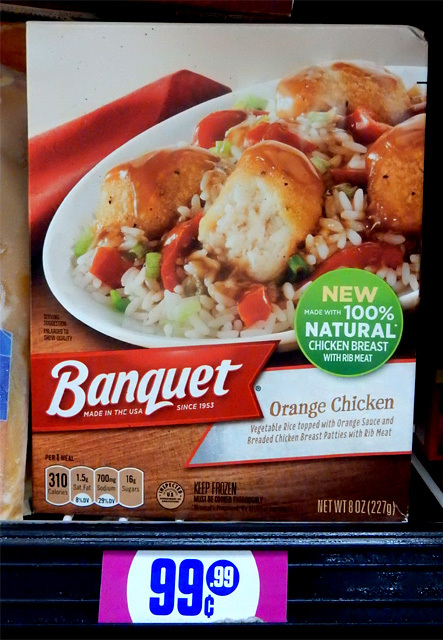 This latest cheap$kate Deal of the Day from Banquet on my Cheap$kate Dining Scale of 1 to 9, 9 being best, gets a lowly 3. Any earned points are for the the rice part of the meal. With the "Natural" hype, my expectations were indeed dashed; so this meal gets deducted points in that regard. Truth in advertising should be paramount - I got suckered again. 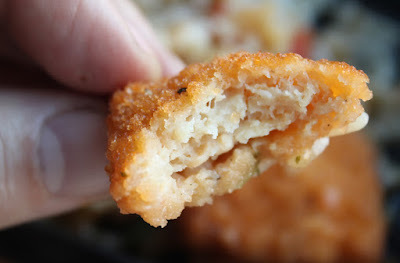 Can look at my blog to see prices, and nutritional facts of chicken at different grocery stores. 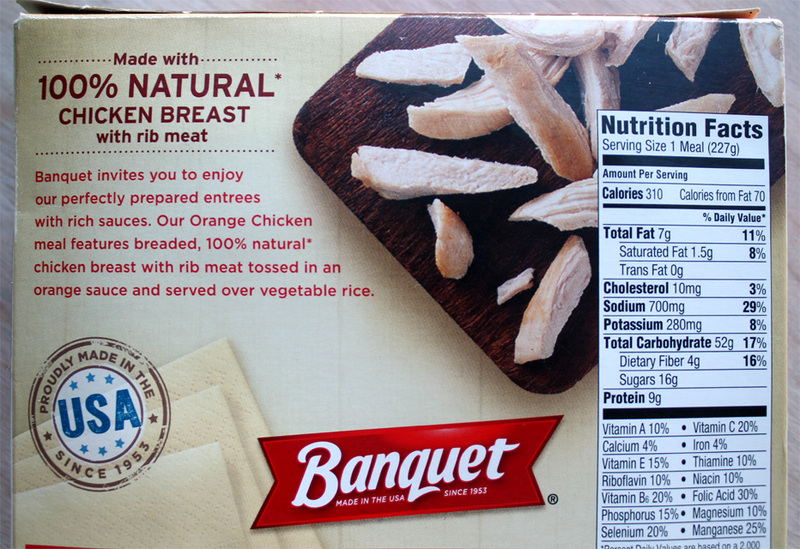 These food companies are noticing that the consumer is starting to pay more and more attention to what is in our food, so they are emphasizing the wording on labels to key words like "natural", and "simply". Dont believe the hype. They havent changed anything. Rib meat is rib meat, (and that could be in the same category as vienna sausages when it comes to whats in it). I dont trust labeling...they are such liars. Same BS different wording thats all. 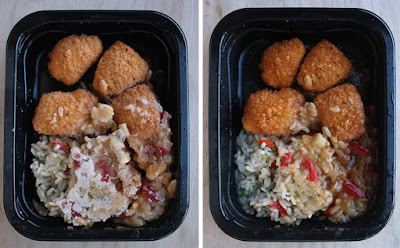 I love these meals. I eat they every day at lunch for work. Sometimes Cub has them for 88 cents each. Of course, they aren't enough for a full meal, I always have to bring a bit of fruit or something but I don't think they are half bad.